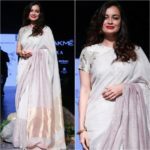 Are you still wearing your silk saree with the plain boring blouse that comes along with it? You need a blouse upgrade ASAP. This season is all about wearing colorful heavily embellished blouses for the gorgeous silk drapes. More than the past few years, we see the craze of heavy blouses capturing the attention of saree lovers from all age spectrums. So if you are still dutifully stitching the blouse that comes with your saree without any form of adornment, you are actually running late to fashion game. However, you can catch up the trend if you follow our regular blouse trend updates. 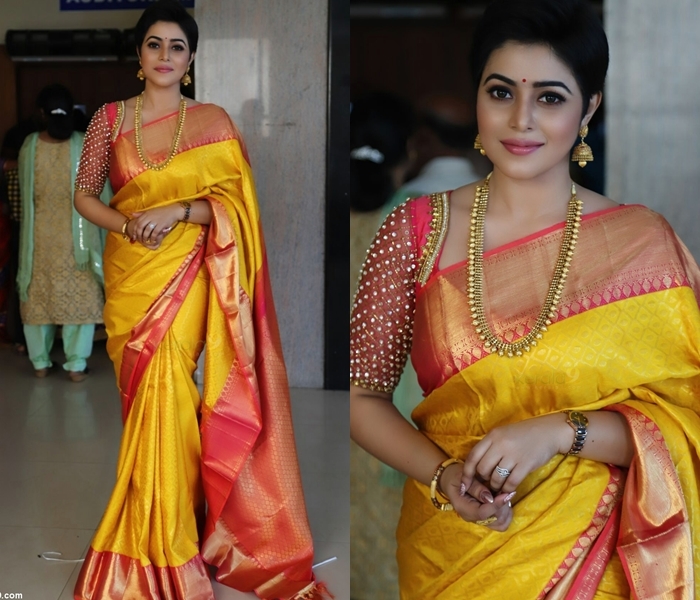 Today we are going to feature a new blouse idea inspired from the pretty saree look sported by Shamna Kasim (aka Poorna) on a recent wedding event. The actress wore a magnificent yellow silk saree with a vibrant pink blouse that was lavishly studded with pristine pearls. On seeing this, we know for sure, this will immediately go to our soon-try-out list. Now take a good look on the enviable blouse style sported by Shamna. Give your blouse style an upgrade with this kind of pearl embellishments and be ready to receive plenty of complements on your coming saree day. Do you Dare to Try Sheer Blouses with Silk Sarees? This Blouse Choice For Blue Saree Will Surprise You!